Beidh an scoil ag glacadh páirt sa bhfeachtas Operation Transformation 10 @ 10 ar an 10/02/2017. Feachtas aclaíochta é seo inar mbeidh gach páiste sa scoil i mbun aclaíochta le chéile ag a 10am ar feag 10 nóiméad. Mar sin bí ag aclaíocht sa bhaile gach tráthnóna ag ullmhú don seisiúin. Le cúnamh Dé éiróidh linn físeán a thógaint don seisiúin agus beidh sé á sheoladh againn chuigh an clár. The school will be taking part in the Operation Transformation event ,10@10 on 10/02/2017. This is an activity in which every child in the school will exercise together at 10 a.m. for 10 minutes. So make sure to exercise every evening between now and then in preparation for the session. Weather permitting, we hope to succeed in taking a film clip of the session and sending it off to the programme. Beidh taispeántas eolaíochta ar scoil le Rang 6 ar an Aoine ar 2.00pm. Beidh seans ag na tuismitheoirí an tionscadal a rinne siad don RDS a fheiscint. Rang 6 will have a science presentation this Friday at 2pm. All parents are invited in to see the work that the class completed for the RDS Science Fair. Beidh Aifreann Cóineartú ar siúl Dé Domhnaigh seo chugainn, 29/01/2017 ar 10 a chlog. 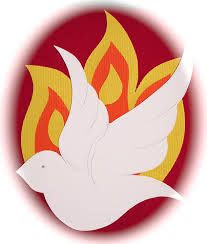 The next Confirmation mass is on next Sunday, 29/01/2017, at 10 o'clock. We hope that all children from Rang 5 & Rang 6 will be able to attend. Meabhrúcháin: Beidh an scoil dúnta an Chéadaoin seo 25/01/17 mar tá cúrsa bunaithe ar an gcuraclam teanga nua á dhéanamh ag na múinteoirí. 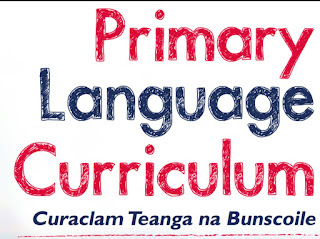 Reminder: The school is closed this Wednesday 25/01/17 as teachers are required to do a course on the New Language curriculum. Dea scéal iontach arís ó cheannceathrú Google... D'eirigh lenár mbeirt ealaíontóirí gabháil tríd go dtí an vótáil poiblí den gcomórtas! Ciallaíonn sé sin go bhfuil DHÁ seans againn an deontas €10,000 a bhuachaint do'n scoil! Beidh orainn agus oraibh a bheith AN dhíograiseach ó thaobh na vótála de. Beidh mé thar nais chugaibh lenár plean gníomh chun an méid is mó vótaí a fháil! Ach go fóill ba mhaith liom chomhghairdeas abhal mhór a gabháil le Archie agus Juliette as ucht an éacht mór a rinne siad i gcóir an scoil. 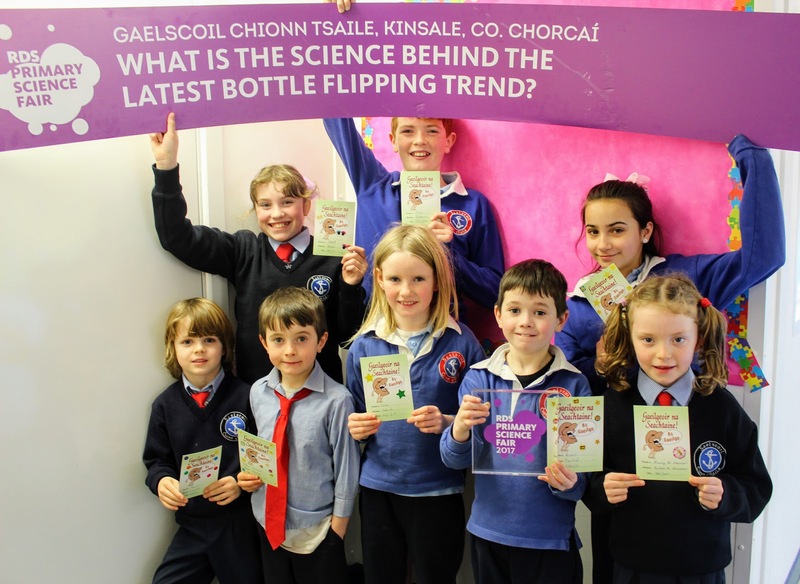 Gaelscoil Chionn tSáile abúúúúúúúúúúúúú! Bíodh deireadh seachtain deas agaibh uile! Here's an update on our good news story from last week... Two of our resident artists have sucessfully gone through to the public vote stage of the Doodle4Google competition! This means that we have TWO chances of winning the €10,000 grant for the school. We will have to be very diligent and proactive about gathering as many votes as possible for the two entries (in two different categories -making our chances of winning even better!) We really need everyone on board to get as many votes as possible. So we'll be asking you to tap as many friends, families, workplaces, societies clubs etc as possible to get them to vote every day as well. I'll keep you posted about our action plan. But for now I want to extend our congratulations to Archie Ó Céilleacháin & Juliette Nic an Taoisigh again for getting this far! Two of the best 75 entries out of thousands and thousands! Very well done to both of you. Gaelscoil Chionn tSáile abúúúúúú! This link https://www.surveymonkey.com/r/WeightofSchoolbags will take you to a brief survey we have compiled on the weight of schoolbags. This survey will run from now, over the weekend, closing at 9am on Monday the 23rd of January. I apologise for the short time frame with this survey, however we need the results for same to do a report in advance of a Joint Oireachtas Committee meeting which will be taking place on Wednesday the 25th of January. It would be great if you could complete the survey on behalf of your child (if more than one child, please complete a separate survey for each child) and if you could email the link to other parents of children in your child’s school. Beimid ag imeacht maidin amárach ar 6 a chlog. Níl cead againn pizzas a ithe san áit. Mar sin, beidh pizzas ag an rang sa Ghaelscoil ar an Aoine. We are leaving tomorrow morning at 6am – 19/01/2017. We are not allowed to eat pizzas in Mary I. Therefore, the children should bring a healthy lunch, snacks. They can also bring up to 5 euro each as there is a canteen. They will get pizzas in the Gaelscoil on Friday. Traenáil ar fáil do gach tuismitheoir. Training available to every parent. Tá an bus ag imeacht níos luaithe ar an Déardaoin. Beimid ag imeacht ar a 6 chlog ar mhaidin. The bus will now be leaving earlier than expected on Thursday. We will be leaving at 6am on Thursday, 19 /01/2017. Táimid go léir ag tnúth go mór leis an Aonach Eolaíochta RDS. 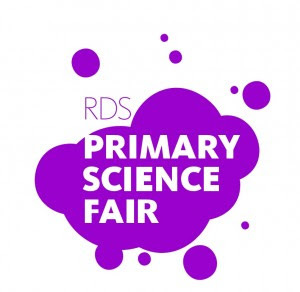 We are all looking forward to the RDS Science Fair! Chríochnaigh Rang 6 a dtionscadail don RDS Science Fair. Rinne siad sár-obair agus táimid go léir ag tnúth go mór leis an taispeántas i Luimneach ar an Déardaoin, 19ú Mí Eanáir 2017. 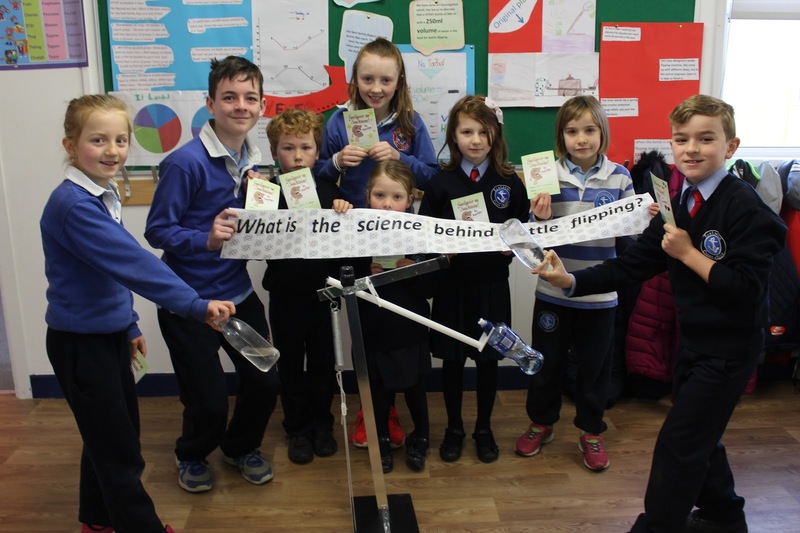 Rang 6 have now finished their science project which they will present it in the RDS Science Fair in Limerick on Thursday, 19/01/2017. 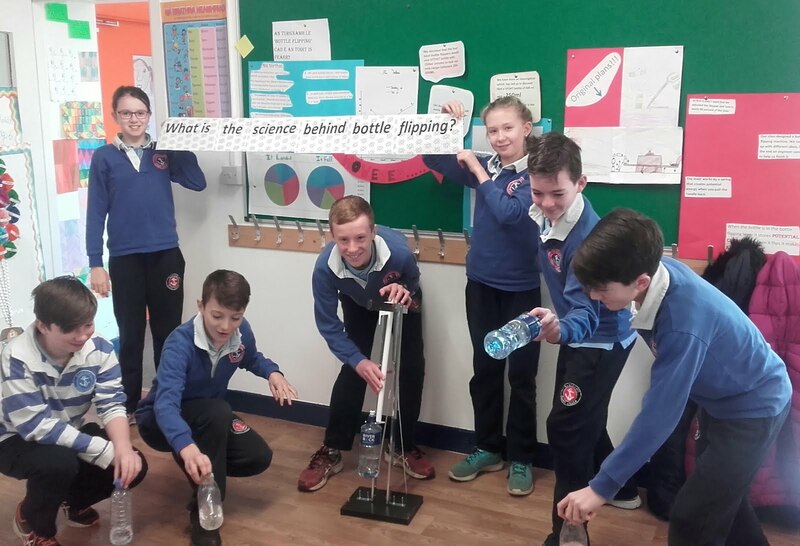 They investigated the science behind the latest trend 'bottle flipping'. Their investigations were based physics: centre of gravity, falling speed of objects, volume, bottle design and they also designed a lever. They used their ICT skills to complete videos and sound recordings. Beimid ag imeacht ar a 6.30am ar maidin. Tá súil agam go dtiocfaimid thar nais i gCionn tSáile ar 5.30pm. The bus will be departing at 6.30am on 19/01/2017 from the Gaelscoil. The fair will run from 9.30am – 3pm so we should be back at the Gaelscoil by 5.30pm. The children should bring a packed lunch and some snacks for the day. Íocfaidh an scoil as an mbus. The school will pay for the bus. 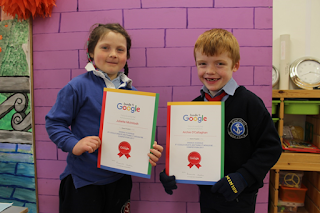 Tá an-áthas orm an dea-scéal a scaipeadh libh gur eirigh le beirt ón scoil dul ar aghaidh sa chomórtas Doodle 4 Google! As na mílte mílte iontrálaithe ghearradh anuas go gearrliosta do 75 pictiúrí agus d'eirigh le pictúirí an bheirt ealaíontóir cumasach Archie Ó Céilleacháin ó rang na Naíonaín Shinsearacha agus Juliette Nic an Taoisigh ó Rang a hAon áit a fháil san ghearrliosta sin! Bualadh bos mór don bheirt! 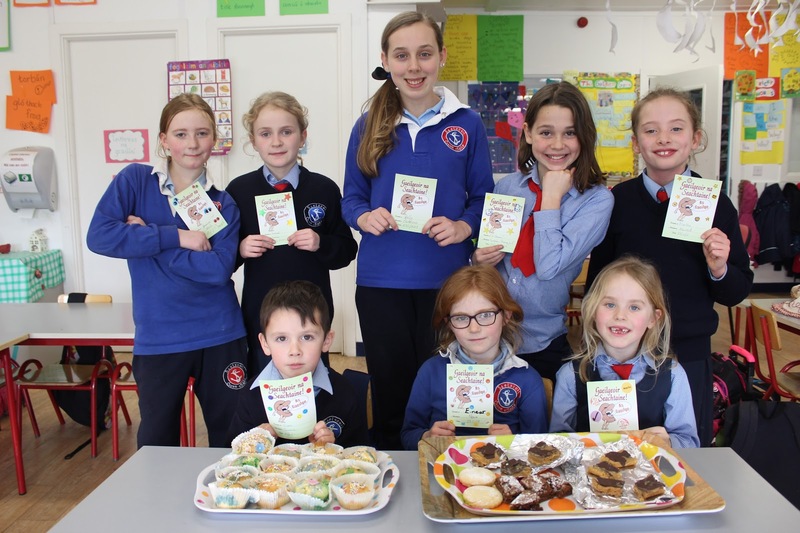 Gaelscoil Chionn tSáile abúúúúúúúúú! I'm delighted to spread the great news that 2 from our school have been chosen to go on to the next stage of the Doodle 4 Google art competition! A shortlist of 75 has been chosen from the thousands and thousands of entries and 2 of that 75 come from our school! 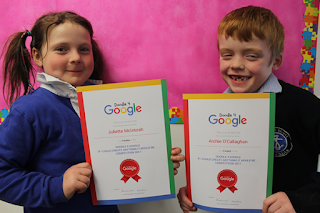 Doodles by two talented artists in our school, Archie Ó Ceilleacháin from Senior Infants and Juliette Nic an Taoisigh from Rang 1, have both been chosen for that shortlist! Well done to them both! Gaelscoil Chionn tSáile abúúúúúú! Táimíd ag féachaint ar uimhireacha agus rollúcháin na blianta atá ag teacht agus teastaíonn uaim a bheith cinnte de go bhfuil gach duine san áireamh agam. Mar sin, má tá aon deirfiúracha nó deartháireaha beaga sa bhaile nach bhfuil cláraithe le tosnú sa Ghaelscoil fós, seol foirm clárúcháin chugainn ina leith le bhur dtola. 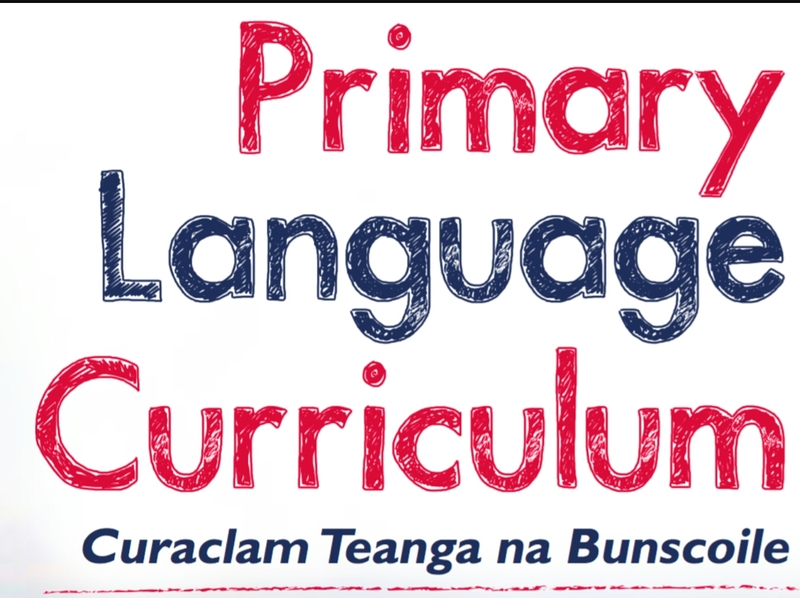 Tá an fhoirm clárúcháin le fáil ar an suíomh www.gaelscoilchionntsaile.ie. Cuir síos an céad bhliain gur féidir leo tosnú (ba cheart go mbeidh an ceithre bhliain slánaithe acu ar nó roimh an 31ú Márta den bhliain tosaithe beartaithe). Ansin má theastaíonn uaibh an bhliain tosnaithe a chur siar níos cóngairí don am, is féidir libh é sin a dhéanamh. Bheadh sé seo an-chabhrach dúinn mar bheadh eolas againn ar uimhearacha sna ranganna ag teacht suas. We are looking at numbers and the enrolment for the coming years and I want to be sure that I have everyone included. Therefore, if there are any small sisters or brothers at home that are not registered to start in the Gaelscoil yet, please send in a registration form for them. The registration form is available on the website www.gaelscoilchionntsaile.ie. Enter the first year that they are eligible or that you would like them to start (they should have reached their 4th birthday on or before the 31st March of the proposed start year). Then, if you feel your child is not ready or if needs be, you can postpone the start year nearer the time. This would be very helpful to us because we will have a clearer idea of numbers for the upcoming classes. Beidh treanáil iománaíochta ar siúl gach Luan ar feadh 8 seachtaine do rang a 3-6 ag tosnú Dé Luain seo chugainn 09/01/17 le Anthony Shannon. Beidh Naí-bheaga- Rang a 2 ag déanamh treanáil sar i bhfad chomh maith le cabhair ó cúpla tuismitheoir agus ár mbuíochas leo. 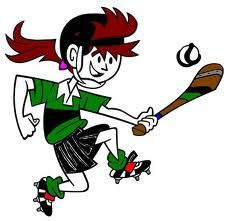 Hurling and camogie training will begin on the 09/01/17 in school with Anthony Shannon for ranganna 3-6. Junior-2nd class hurling and camogie training will also commence in the coming weeks with the help of some parents. Ár mbuíochas leo.